I make visual artwork about human and animal lives in an unstable world. I puzzle out specific entangled situations and try to step beyond my own viewpoint to look at how humans shape the world. I make detailed case studies, finding people with expertise and enthusiasm to work with. 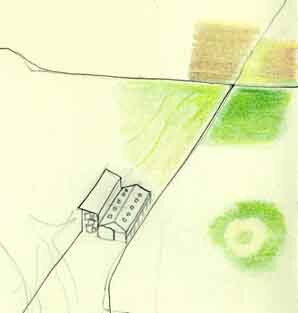 Each project develops in its own way according to its context but drawing is always central. A Leverhulme Fellowship at Glasgow University (2005) allowed a series of collaborative ‘biogeographies’ to develop with geographers and museum staff, using a zoological museum as an archive to explore some of the ways that species extinction may happen. These projects took unexpected turns – such as taking a swallow along its migration route, sailing with a butterfly whose species may seek colder climes, taking a study-skin of a hen harrier to the place where it had been killed in the 1920s, or becoming knowledgeable about an exceptionally rare extinct South African bluebuck skull. Moving to the Borders prompted me to start the project ‘drawing in the field’ – looking at local land use and how we, as humans, place animals and wildlife in our culture. Border Sheepscapes (Visual Arts Award, 2010) made me understand the resources of knowledge, skill and design underlying workaday ‘pastoral’ scenery, as well as what a hard winter in the valleys can be like. I want to expand ecological awareness and live sustainably: art is one way to communicate how complex and surprising things are. The seasonal rhythm of maintaining a productive polytunnel keeps me rooted. I live in the upland part of the Tweed catchment. I keep links with Glasgow Sculpture Studios and Glasgow University, having studied environmental art at Glasgow School of Art after gaining a PhD in social policy from Stirling University. As an artist I am engaged locally and also work internationally.